The company is none of the main John Deere dealers in Scotland. 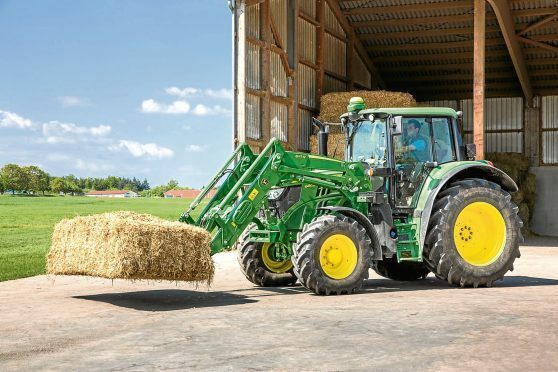 The main John Deere dealer in the north and north-east enjoyed a boost in profits and turnover last year. Accounts filed with Companies House reveal HRN Tractors posted pre-tax profits of £607,440 for the year ended September 30, 2016. This is up 25% on the year before when pre-tax profits stood at £486,098. Turnover at the Insch-headquartered company was also up in the year by 10% to £28.171million, from £25.569million in the year before. In the accounts, managing director Neil Barclay said: “The company’s trading performance during the year was consistent with the directors’ expectations given the improved trading conditions in the industry from the prior year which were exceptionally difficult. Mr Barclay said the company’s operations had generated healthy cash flows during the year and the balance sheet remained strong. As well as its base in Insch, the company has depots in Turriff, Kinloss, Muir of Ord, Wick, and Balbeggie in Perthshire. It also has a specialist export company, named Agritrac Exports, which launched in 2004 and is based near Stirling. The latest accounts for the firm, which cover the year ended May 31, 2016, reveal an increase in both turnover and profits. Turnover at the firm was up to £7.157million, from £6.998million the year before. This was against an 84% increase in pre-tax profits to £335,962, from £182,180 previously. The bulk of the sales – £6.165million – were to the UK. Sales overseas reduced by 9% to £992,301, from £1.095million previously. The companies’ accounts depict a similar picture to trading improvements being experienced by other farm machinery dealers in the region. Last week, Sellars Agriculture revealed a boost in profits for the year ended September 30, 2016. The Olmeldrum-based firm, which is one of the main Claas dealerships in Scotland, recorded pre-tax profits of £121,152 for the year. This is up from pre-tax profits of £9,212 the year before. Turnover at the firm, which also has bases at Forres, Huntly, Cupar, Perth and Letham in Angus, was down 13% to £23.749million.